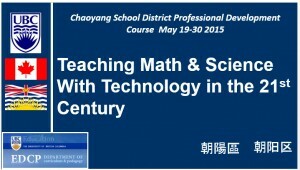 I am honoured to be invited to teach a special two-week professional development course for mathematics and science educators in China (Chaoyang School District in Beijing). I am looking forward to it as I am sure I will learn a lot from our Chinese colleagues. It is going to be my second visit to Beijing and I hope it will open doors for more collaborations. Chinese mathematics and science education and especially teacher education is different from what we have here in Canada. So it will be a great opportunity to learn from them and to take some ideas back to Canada. Some time ago I read a great book by Liping Ma: Knowing and Teaching Elementary Mathematics. It made a big impression on me and since then I wanted to see with my own eyes how Chinese teachers are prepared. In some ways, my own growing up in the Soviet Union is also relevant as Soviet education system was also very different from what we have here and I think our mathematics and science teachers there were well prepared to teach these subjects. The main difference I see is the depth and breadth of teacher preparation. 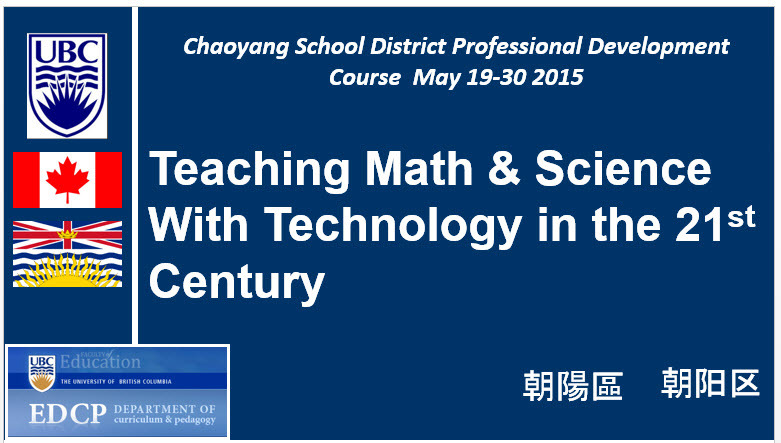 The course I will be teaching will focus on the use of technologies in mathematics and science education. It is clear to me now that in the process of using technology we will also discuss how we teach mathematics and science in our countries. I am sure it will be exciting! Antimirova, T., & Milner-Bolotin, M. (2009). Introduction to Video-Based Motion Analysis. Paper presented at the Canadian Association of Physicists Congress 2009, Moncton, New Brunswick. Bates, S. P., Galloway, R. K., & McBride, K. L. (2012). Student-generated content: using PeerWise to enhance engagement and outcomes in introductory physics courses. 4. Beatty, I. D., Gerace, W. J., Leonard, W. J., & Dufresne, R. J. (2006). Designing effective questions for classroom response systems teaching. American Journal of Physics, 74(1), 31-39. Committee on Conceptual Framework for the New K-12 Science Education Standards; National Research Council. (2012). A Framework for K-12 Science Education: Practices, Crosscutting Concepts, and Core Ideas (Vol. In press, pp. 401). Cortés-Figueroa, J. E., Moore-Russo, D. A., & Schuman, M. J. (2006). Using a CBL Unit, a Temperature Sensor, and a Graphing Calculator To Model the Kinetics of Consecutive First-Order Reactions as Safe In-Class Demonstrations. Chemistry Education, 83, 64. Duncan, D. (2005). Clickers in the Classroom. San-Francisco, Boston, NY: Pearson Education. Finkelstein, N. D., Adams, W. K., Keller, C. J., Kohl, P. B., Perkins, K. K., Podolefsky, N. S., . . . LeMaster, R. (2005). When learning about the real world is better done virtually: A study of substituting computer simulations for laboratory equipment. Physical Review Special Topics – Physics Education Research, 1(1), 010103. Finkelstein, N. D., Perkins, K. K., Adams, W., Kohl, P., & N. Podolefsky, P. P. (2004). Can Computer Simulations Replace Real Equipment in Undergraduate Laboratories? Paper presented at the Physics Education Research Conference. Finkelstein, N. D., Adams, W. K., Keller, C. J., Kohl, P. B., Perkins, K. K., Podolefsky, N. S., et al. (2005). When learning about the real world is better done virtually: A study of substituting computer simulations for laboratory equipment. Physical Review Special Topics – Physics Education Research, 1(1), 010103. Gee, J. P. (2005). Learning by design: Good video games as learning machines. E–Learning, 2(1), 5-16. Hoffman, C., & Goodwin, S. (2006). A clicker for your thoughts: Technology for active learning. New Library World, 107(1228/1229), 422-433. Jimoyiannis, A. (2010). Designing and Implementing an Integrated Technological Pedagogical Science Knowledge Framework for Science Teachers Professional Development. Computers & Education, 55(3), 1259-1269. Keller, C., Finkelstein, N., Perkins, K., Pollock, S., Turpen, C., & Dubson, M. (2007). Research-based Practices for Effective Clicker Use. Paper presented at the 2007 Physics Education Research Conference, Greensboro, NC. Koehler, M. J., & Mishra, P. (2009). What is technological pedagogical content knowledge? Contemporary Issues in Technology and Teacher Education, 9(1), 60-70. Lasry, N. (2008). Clickers or flashcards: Is there really a difference? The Physics Teacher, 46(5), 242-244. Lasry, N., Mazur, E., & Watkins, J. (2008). Peer Instruction: From Harvard to the two-year college. American Journal of Physics, 76(11), 1066-1069. Loverude, M. E. (2009). A research-based interactive lecture demonstration on sinking and floating. American Journal of Physics: Physics Education Research Section, 77(10), 897-910. Milner-Bolotin, M., Cha, J., & Hunter, K. (2012). Investigating Science Questioning Practices of Elementary Pre-Service Teachers: Design of Elementary Science Questions Evaluation Rubric. Paper presented at the American Educational Research Association Annual Meeting, Vancouver, BC, Canada. Milner-Bolotin, M. (2004). Tips for Using a Peer Response System in Large Introductory Physics Classroom. The Physics Teacher, 42(8): p. 47-48. Milner-Bolotin, M., et al. (2013). “Modeling active engagement pedagogy through classroom response systems in a physics teacher education course.” LUMAT: Research and Practice in Math, Science and Technology Education 1(5): 525-544. Milner-Bolotin, M. and S. Nashon (2012). “The essence of student visual–spatial literacy and higher order thinking skills in undergraduate biology.” Protoplasma 249(1): 25-30. Milner-Bolotin, M., Kotlicki, A., & Rieger, G. (2007). Can students learn from lecture demonstrations: The role and place of interactive lecture experiments in large introductory science courses. Journal of College Science Teaching, 36(4), 45-49. Milner-Bolotin, M. (2015). Increasing girls’ participation in physics: Education research implications for practice. Physics in Canada, 71(2), 4 p.
Milner-Bolotin, M. (2014). Using PeerWise to promote student collaboration on design of conceptual multiple-choice questions. Physics in Canada, 70(3), 149-150. Moll, R., & Milner-Bolotin, M. (2009). The effect of interactive lecture experiments on student academic achievement and attitudes towards physics. Canadian Journal of Physics, 87(8), 917-924. National Center for Education Statistics. (2000). Teachers’ Tools for the 21st Century: A Report on Teachers’ Use of Technology. Perkins, K., Adams, W., Dubson, M., Finkelstein, N., Reid, S., Wieman, C., & LeMaster, R. (2006). PhET: Interactive Simulations for Teaching and Learning Physics. The Physics Teacher, 44(January 2006), 18-23. Powers of Ten: http://www.powersof10.com/ an online resource for mathematics teachers (based on the film by Charles and Ray Eames). Sokoloff, D. R., & Thornton, R. K. (2004). Interactive lecture demonstrations: Active learning in introductory physics: John Wiley and Sons, INC.
Straits, W. J., & Wilke, R. R. (2006). Interactive Demonstrations: Examples from Biology Lectures. Journal of College Science Teaching, XXXV(4), 58-59. Thornton, R. K., & Sokoloff, D. R. (1997). Real Time Physics: Active Learning Laboratory. College Park, MD, USA: The American Institute of Physics. Wieman, C. E., & Perkins, K. K. (2006). Commentary: A powerful tool for teaching science. Nature Physics, 2, 290 – 292. Wieman, C. E., Adams, W. K., Loeblein, P., & Perkins, K. K. (2010). Teaching Physics Using PhET Simulations. The Physics Teacher, 48(April), 225-227. This work by Marina Milner-Bolotin is licensed under a Creative Commons Attribution-NonCommercial 3.0 Unported.